ILSL - Internacional Journal of Leprosy and other Mycobacterial Diseases- EDITORIALS- Cogitations on the cultivation of <i>Mycobacterium leprae;</i> why bother? Cogitations on the cultivation of Mycobacterium leprae; why bother? Editorial opinions expressed are those of the writers. Present generations in Western Europe, Japan, and America must learn from medical history and from the disadvantaged world the awesome costs of infectious and parasitic diseases. Pearl Buck of China remembers: ";My young mother had four children rather rapidly and as rapidly lost three of them to tropical diseases, which at that time no one understood how to prevent or to cure. "; An advantage of current civilization is that we know little of such grief and suffering. Senior citizens recall their childhood diseases-measles, mumps, chicken-pox, diphtheria, whooping cough, scarlet fever, etc. Smaller numbers had typhoid, or undulant fever, dysentery, tuberculosis, poliomyelitis, the typhus of Brill's disease, rheumatic fever, and heart disease. These diseases have disappeared from privileged regions of the world in large part because biomedical scientists have learned where infectious agents reside, both inside and outside of patients. In this respect, knowledge of leprosy remains in the Middle Ages. In fact, Bergel is consoled by the omission of cultivation from the research priority lists of some eminent leprologists 2,3 in recent years. These investigators have expressed confidence in the power of genetic engineering to resolve the multitudinous problems of the bacillus. However, it appears to be acknowledged today that the harvest gained directly from the novel tools of molecular biology has been disappointingly meager.4,5 Most of the six proteins have been identified through the use of murine monoclonal antibodies, and most are heat-shock proteins sharing sequences and antigens with a number of other bacteria and man. Realistic views are entertained by many biomedical scientists. In order to support, or reject, his view that cultivation deserves top priority in leprosy research, Kato 6 circulated a professionally designed questionnaire to 120 randomly selected equal numbers of clinicians, pathologists, epidemiologists, pharmacologists, bacteriologists, and specialists in tropical medicine. The key question was: ";Which field should be given top priority in leprosy research? "; The opinions among the 62 respondents were: cultivation 47 (76%), immunology 7 (11%), therapy 6 (10%), epidemiology 2 (3%). Around 1977 Sansarricq of the World Health Organization (WHO) tried to establish a BioLep (cultivation) program. The council ruled against it, because spurious claims have kept the topic in disrepute. During the past 4 years, WHO documents on leprosy have not mentioned cultivation. Meanwhile, the contributions of cultivation to understanding and classifying the agents of filariasis, leishmaniasis, malaria, and trypanosomiasis are celebrated in every document on parasitology. I am now ready to examine the blindness of microscopy and to review the vast array of knowledge gained by cultivating a once noncultivable mycobacterium. Counting. Enumeration of bacterial populations in standard films requires a 100-fold increase in bacterial concentrations.8 To count 200 bacilli/strip by the pinhead method, 10 8,4 bacilli/ml are required. Shep-ard and McRae 9 reported that their counting system would require nearly 10-fold more bacteria, i.e., ±; 109 bacilli/ml. Part of the blindness of microscopy arises from a failure to recognize that two different approaches are required for diagnosis and for counting. 10 This tedious study showed that diagnostic sensitivity is defeated by the habit of trying to spread skin scrapes to uniform diameters on glass slides. In 29 such smears, the average over-dilution was 4.4 times. Films of maximal density (minimal area) permitting clear vision of bacilli are made by minimal spreading. Although such films retain only 65% of the bacilli added, they are 2.6 times more sensitive than films appropriate for counting. Since 4.4 x 2.6 = 11, microscopic sensitivity can be increased more than 1 log by proper preparation of films on glass slides. The thinner films of uniform density for counting can be prepared with a little practice and (as noted above) increase the usual sensitivity more than fourfold. An accompanying paper will demonstrate [would have demonstrated -RCH] that sensitivity can be further increased by optimal preparation of carbol fuchsin stains and by differentiation, i.e., by counterstaining while decolorizing. Persisters and relapse. The inescapable need for high-plating efficiency is emphasized by inabilities to evaluate modern treatments of leprosy. In 1982, WHO recommended multidrug therapy (MDT) for two different kinds of patients (Technical Report Series No. 716). For paucibacillary persons (few or no bacilli by microscopy) the recommendation is two drugs, rifampin and dapsone, during a period of 6 months. Since paucibacillary patients arc distinctly more resistant than lepromatous ones, optimal results might be expected. Patricia Rose (THE STAR, July-August, 1984) reported results in 284 paucibacillary patients. Seven (2.5%) of the treated patients relapsed within 12 months after cessation of treatment. Two of the seven failures responded to further treatment. One became smear positive and was placed in a multi-bacillary group. In two patients treated further with rifampin and dapsone plus Han-solar® and thiambutosine, new lesions were appearing. At the 1984 U.S. Hansen's Disease Research Conference at Carville, Louisiana, U.S.A., Gelber, et al. expressed their frustrations as follows: ";Nevertheless ... all therapeutic regimens used thus far, including those utilizing rifampin, are not -sterilizing, and, despite years of treatment, patients continue to harbor drug-sensitive, viable bacilli, 'persisters.' "; In efforts to define optimal therapies, these investigators sought more sensitive monitoring of treatments by comparing four rodent systems while using at least 10 6 bacilli as inocula. Because of latency in test animals, further subpassages to mice were often needed to prove the infectiousness of samples. Although such efforts may be necessary at present, leprosy programs cannot afford this awesome price while present regimens are being evaluated. Cultivation with high-plating efficiency. Given plating efficiency, enormous gains can be made by measuring significant changes in bacterial populations. A shift from 10 3 to 10 5 bacilli per gram of tissue is below the range for microscopy, and is unlikely to alter the appearance of residual lepromatous lesions. Nevertheless, a 1000-fold increase in viable bacteria reveals an ominous drift toward relapse, a drastic decrease in the effectiveness of a drug regimen, or an unfavorable shift in resistance. Clinical. Paratuberculosis (Johne's disease, diarrhea and wasting in ruminants) is the terminal stage of a slow, chronic, subclinical mycobacterial infection which originates in the lower ileum and ileocecal valve. It is largely confined to intestine and adjacent lymph nodes (regions where the bacterial growth factor is presumed to be available). The incubation period is usually 3 to 5 years, during which the bacillus may be shed in feces. The histology of early lesions tends to be tuberculoid and with advancing disease the massive lesions become lepro-matoid. Cell-mediated resistance declines and antibodies become abundant.11 Thus, Johne's and Hansen's diseases share several fundamental features. Etiology. M. paratuberculosis for 17 years was a famous noncultivable mycobacteri-um.14 Growth in vitro turned out to depend upon an iron chelator, mycobactin.15 Physiologically related mycobactin-dependent mycobacteria cause a lepromatous disease in the wood pigeons of Scandinavia and northern England;13,16 also in the Mexican green parrot.17 Feeding wood pigeon bacilli to calves gives rise to Johne's disease. Thus, such agents are restricted preponderantly to animals with a rumen or gizzard (microbial fermentors as the first component of the digestive system). Phenomenal success in the decontamination of feces permits plating the organism from large samples. The current plating efficiency detects fewer than one bacillus per gram of feces. Heterogeneity among isolates of M. leprae cannot yet be examined. Survival in nature. Table 1 shows that lack of growth competence in vitro docs not prevent survival in nature. The observations may have a significance beyond what meets the eye. Would we expect a nongrow-ing population of microbes to be found after dilution in river water for 5 months? The bacilli persist in ponds in spite of the hazards of sunlight and repeated freeze-thaw cycles. They persist in feces and soil in Iowa and Wisconsin, U.S.A., in spite of repeated dehydration and freeze-thawings. Is all this possible without intervening periods of growth? In studies on leprosy, direct smears examined by Kazda, et al. 19 in Norway revealed a high incidence of noncultivable mycobacteria in the areas with formerly the highest leprosy rates.20 Twenty-one percent of these samples were shown to grow in the mouse foot pad. My microscopic investigations of mycobacteria revealed that M. leprae possess the widest capsules found in mycobacteria.21,22 Davey and Rees 23 found that M. leprae is viable in dried nasal secretions for up to 5 days. Transmission. Table 2 shows that, although the growth requirement of M. paratuberculosis restricts Johne's disease preponderantly to ruminants, this opportunist succeeds in individual monogastric farm animals. These animals tend to be asymptomatic shedders of infection. The reported isolations of M. paratuberculosis from humans with regional ileitis now total two. Epidemiology. For a person starved by reviewing the epidemiology of leprosy with no knowledge of how, when or where the ";red bacillus"; latched onto a recognized patient, the epidemiology of Johne's disease is a treat. In this case, three epidemiologies arc interrelated: the epidemiology of the spread of the bacillus, the epidemiology of covert and spreading infections, and the epidemiology of Johne's disease. For example, during routine pregnancy tests in three herds thought to be free of paratuberculosis the cultivation of M. paratuberculosis from feces showed 33%, 31%, and 35% of the animals to be infected (1 citation in 13). Infected animals often excrete 107 bacilli per gram of feces and 5 x 10 12 bacilli per day. Unknown sources of infection play a preponderant role in the transmission of leprosy. Three classic epidemiologic studies examined the frequency with which one can designate the source of infection for newly certified cases. Table 3 shows that, on average, 75% of new cases arose from unknown sources. Kluth,28 trained by Doull and Guinto, investigated Texas, because low prevalence should decrease erroneous assignments. We may accept his 84% of new cases from unknown sources as valid. In brief, if we now could throw a perfect net of containment around each discoverable case, the next decades will yield six times that number from unidentifiable sources. As noted, we must expect that a few cases will arise from nonhuman sources. Treatment. 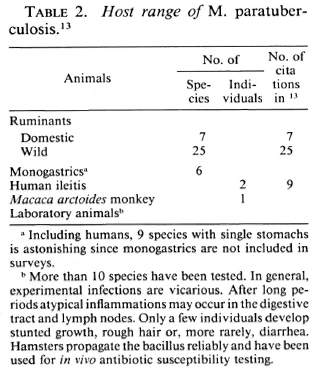 A cure for paratuberculosis does not seem more promising today than it did 50 years ago.13 Although the bacillus is susceptible to many antituberculosis drugs in vitro (8 citations in 13), treatment schemes have not been successful (6 citations in 13). Treated animals often improve clinically, but continue to shed the bacillus, and eventually succumb to the disease (4 citations in 13). ";In some studies, treatment with anti-tuberculosis drugs prior to and during exposure to M. paratuberculosis did not prevent infection or the development of lesions (2 citations in 13). In leprosy, 30 years of sulfone therapy were required to dampen the enthusiasm of leprologists and the great expectations aroused in patients. A further 10 years were required to agree on multidrug regimens. We enter this new phase with no drug designed with knowledge of specific effects on M. leprae and no means to achieve this goal. Vaccination. The subcutaneous injection of virulent or attenuated organisms or of heat-killed or methanol-extracted M. paratuberculosis cells induces tuberculin-type hypersensitivity and increases resistance. Maximum resistance lasts only 18 months (2 citations in 13). The cross-sensitizations to avian and mammalian tuberculins interfere with bovine tuberculosis control programs. The enhanced resistance decreases the excretors. It may protect from clinical disease or merely delay its onset during the productive years of cows. The Wisconsin field studies (2 citations in 13) in 287 herds demonstrated a 90% reduction in clinical disease, but only a 50% reduction in the number of infected animals (shedders). Thus, vaccinated herds are not regarded as free of M. paratuberculosis. In leprosy, the current WHO proposals are superior because they include the use of heat-killed M. leprae plus BCG as an adjuvant. Prevention and control. Lessons learned from a disease in valuable animals are inescapable because cost-effectiveness is the only consideration. Having been able to recognize persistent infections, neither treatment nor immunization as practiced to date are recommended. Investments are being made in a broad 13-point program which includes slaughter of all infected animals and their offspring. Since such measures are unthinkable in leprosy, and since known cases give rise to only 27% of the problem (Table 3), we urgently need the knowledge to be gained by cultivation. This one-sided conversation opened by asking ";Why bother? "; This question is answered for me by the multitude of useful findings provided by the once noncultivable M. paratuberculosis. The fundamental point is that the control of an infectious disease depends upon being able to learn whatever seems pertinent to the spread of infection and the welfare of patients. Having spent 45 years trying to cultivate M. leprae, I know that investigators of the required caliber are wise enough to investigate more fruitful matters. If so, this matter lies in the hands of funding agencies determined to supply continuous support. Such support is no longer a gamble since pub-lishable information can always be gained by ultrasensitive analyses of bacterial ATP (adenosine triphosphate) to measure increases and decreases in functional biomass. This tool enabled Dhople and Hanks 29-31 to define the physiologic status, or numbers, of M. lepraemurium under every pertinent circumstance and to establish its continuous growth in the Nakamura system.12 It is no longer a question whether M. leprae can be cultivated. The only question is how long it may take. The best investment might be to support two groups of investigators. While Dhople and I were learning to propagate M. leprae-murium, we often said: ";Our kingdom for a worthy competitor who explores one set of possibilities while we explore others. "; The sharing of information might have proven again that 2x2 = more than 4. Innumerable spurious claims of cultivating M. leprae have soiled the reputation of this field. Aside from eventual disappointments, time and funds are wasted by those who try to confirm such reports and by those who prove their fallacy by classifying the agent recovered. These costly exercises can be terminated if editors will decree that claims of cultivation require two manuscripts: one from the original investigators and one that confirms the essential findings. Goals in cultivation. Once M. leprae has been induced to grow in vitro, work must proceed in two different directions: a) maximal crop production, and b) maximal plating efficiency. These undertakings demand two different kinds of training and specialization. Since many will participate in crop production, I urge the more difficult goal of high-plating efficiency. Legal systems universally betray one of the weakest and most costly of human traits: the proposition that one party is right and the other is wrong. How silly! The record says that the ";genetic engineers"; are totally against the cultivation of M. leprae. I hope that ";cultivators"; will never be that bigoted. Why not enjoy the advantages of both approaches on the basis of efficiency and cost-effectiveness? Acknowledgment. I would like to express my deep gratitude to the Damicn-Dutton Society for Leprosy Aid, Inc., Bellmorc, New York, for many years of steadfast support in the effort to cultivate Mycobacterium leprae. 1. Bergel, M. Warning about At. leprae's culture. Lepr. Sci. Memo. September, 1984. 2. Bloom, B. R. and Godal, T. Selective primary health care: strategics for control of disease in the developing world. V. Leprosy. Rev. Infect. Dis. 5 (1983) 765-780. 3. Draper, P. Leprosy bacillus outwitted. Nature 316 (1985) 388-389. 4. Hunter, S. W., McNeil, M., Modlin, R. L., Mchra, V., Bloom, B. R. and Brcnnan, P. J. Isolation and characterization of the highly immunogenic cell wall-associated protein of Mycobacterium leprae. J. Immunol. 142 (1989) 2864-2872. 5 . Watson, J. D. Prospects for new generation vaccines for leprosy: progress, barriers, and future strategics. Int. J. Lepr 57 (1989) 834-843. 6. Kato, L. Trends in leprosy research; cultivation of the neglected priority. Lepr. Sci. Mem. September, 1982. 7. Hanks, J. H. Microscopic counts of mycobacteria; conversion factors for the pinhead method. Int. J. Lepr. 36 (1967) 76-77. 8. Hanks, J. H., Chatterjce, B. R. and Lechat, M. F. A guide to the counting of mycobacteria in clinical and experimental materials. Int. J. Lepr. 32 (1964) 156-167. 9. Shepard, C. C. and McRae, D. H. A method for counting acid-fast bacteria. Int. J. Lepr. 36 (1968) 7882. 10. Hanks, J. H. Quantitative aspects of sampling leprosy skin lesions by the scraped incision method. Int. J. Lepr. 24 (1956) 424-433. 11. Warndorff-van Diepen, T. and Genene Mengistu. Relapse rate and incidence of dapsone resistance in lepromatous leprosy patients in Addis Ababa: risk factors and effect of short-term supplementary treatment. Int. J. Lepr. 53 (1985) 189-197. 12. I am indebted to Richard S. Merkal of the National Animal Disease Center for a recent comprehensive of paratuberculosis by Chiodini, et al. "; Instead of individual references, the number of publications that support a given point will be indicated, e.g. (4 citations in 13). 13. Chiodini, R. J., Vankruiningcn, H. J. and Merkal, R. S. Ruminant paratuberculosis (Johne's disease): the current status and future prospects. Cornell Vet. 74 (1984) 218-262. 14. Twort, F. W. and Ingram, G. L. Y. A monograph on Johne's disease (Enteritis chronica pseudotuberculous bovis). London: Baillier, Tindall & Cox, 1913. Reprinted in Int. J. Lepr. 34 (1966) 44-55. 15. Francis, J., Madinavcitia, J., Mactark, H. M. and Snow, G. A. Isolation from acid-fast bacteria of a growth factor for Mycobacterium johnei and a precursor of phthiocol. Nature 163 (1949) 365-366. 16. Christiansen, M., Ottosen, H. E. and Plum, N, A peculiar infection of acid-fast bacteria in wood pigeons (Columbapalumbus, L.). Skand. Vet. Tidskr. 36 (1946) 452-469. 17. Wherry, W. B. A leprosy-like disease in the lungs of a Mexican parrot. J. Infect. Dis. 27 (1920) 293. 18. Chiodini, R. J. Biochemical characteristics of various strains of Mycobacterium paratuberculosis. Am. J. Vet. Res. 47 (1986) 1442-1445. 19. Kazda, J., Irgens, L. M. and Müller, K. Isolation of non-cultivable acid-fast bacilli in sphagnum and moss vegetation by foot pad technique in mice. Int. J. Lepr. 48 (1980) 1-6. 20. Irgens, I. M. and Bjcrkdal, T. Epidemiology of leprosy in Norway: the history of the national registry of Norway from 1856 until today. Int. J. Epidemiol. 2 (1973) 81-89. 21. Hanks, J. H. Significance of capsular components of Mycobacterium leprae and other mycobacteria. Int. J. Lepr. 29 (1961) 74-83. 22. Wade, H. W. Capsules of pathogenic mycobacteria. Int. J. Lepr. 29 (1961) 221-224. 23. Davey, T. F. and Rees, R. J. W. The nasal discharge in leprosy: clinical and bacterial aspects. Lepr. Rev. 45 (1974) 121-134. 24. Walsh, G. P., Meyers, W. M., Binford, C. H., Gormus, B. J., Baskin, G. B., Wolfe, R. H. and Gerone, P. J. Leprosy as a zoonosis: an update. Acta Leprol. (Geneve) 6 (1988) 51-60. 25. Meyers, W. M. Personal communication, 1990. 26. Lumpkin, L. R., Cox, G. F. and Wolf, J. E. Leprosy in armadillo handlers. (Leiter) J. Am. Acad. Dermatol. 10 (1984) 1073. 27. West, B. C, Todd, J. R., Lary, C. H„ Blake, L. A., Fowler, M. D. and King. j. W. Leprosy in six isolated residents of northern Louisiana; time-clustered cases in an essentially nonendemic area. Arch. Intern. Med. 148 (1988) 1987-1992. 28. Kluth, F. C. Leprosy in Texas; a study of occurrence. Texas State Univ. J. Med. 51 (1955) 199-205. 29. Dhople, A. M. and Hanks, J. H. Quantitative extraction of adenosine triphosphate from cultivable and host-grown microbes: calculation of adenosine triphosphate pools. Appl. Microbiol. 26 (1973) 389-403. 30. Dhople, A. M. and Hanks, J. H. Factors that influence the growth of Mycobacterium lepracmurium in the Nakamura system. Int. J. Lepr. 44 (1976) 18-26. 31. Dhople, A. M. and Hanks, J. H. In vitro growth of Mycobacterium lepraemurium: transition from in vivo grown to in vitro adaptation. Kurume Med. J. 27 (1980) 149-155. 32. Nakamura, M. Multiplication of Mycobacterium lepraemurium in cell-free medium containing a-kcto-glutaric acid and cytochrome c. J. Gen. Microbiol, 73 (1972) 193-195. 33. Guinto, R. S. and Rodriguez, J. N. A field study of leprosy in Talisay, Cebu, Philippines. Int. J. Lepr. 9 (1941) 149-166. Reprint requests to Dr. Noel R. Rose at the above address. *Dr. John Hanks was invited to prepare a series of Guest Editorials for these pages reviewing his incomparable experiences in attempting to cultivate M. leprae. Before his death, he completed a rough draft of the present manuscript. Dr. Paul Converse and Mrs. Hemine Bongers edited the manuscript, and it was then submitted by Dr. Noel R. Rose as the last of a long line of contributions by Dr. Hanks to the scientific literature-RCH.